The changing of the seasons has been gradual if not insignificant for many of the past few years. This year however has brought us surprises and an early boding of seasonal significance we will remember for some time. For example a common sign of Fall is a layer of frost on field pumpkins. 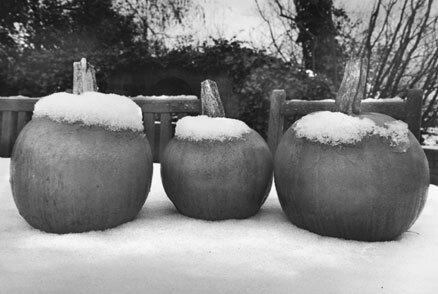 This year, these members of the squash family have experienced unexpected Autumn extremism bringing a twist of surrealism to our scenery and road conditions. When we take time to put aside our everyday survival related thoughts we feel a strange attraction to many snow related remembrances. These psychological hallmarks are emotionally charged from many varied holiday escapades we have endured combined with snowstorm related childhood memories and moods. The e-mailing and phone calling craze of schedule changing is now beginning because of over booking and too many options to consider. Holiday spirits are easily consumed with gift and party commitments that have monetary or time budget constraints in place. We are now left to contemplate that possibly the greatest gifts we can give each other are our meaningful time and prayers that sustain our friendship.